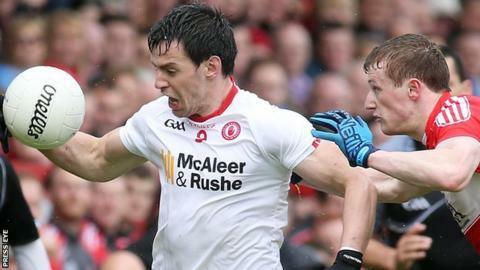 Tyrone stormed into the semi-finals of the Ulster Championship with a clinical demolition of Derry at Celtic Park. Ronan O'Neill scored two goals and Peter Harte netted another just before half-time to give Mickey Harte's men a commanding 3-8 to 0-6 interval lead. Derry did manage four unanswered points after the break but finished the game with just 13 men. Ciaran McFaul was dismissed for yellow and black cards while Chrissy McKaigue got a straight red for elbowing. Near the end of the game, McKaigue tussled with Tyrone midfielder Colm Cavanagh and was sent off by Meath referee David Coldrick. Underdogs Derry seemed to have made a decent start, but were rocked by two goals by Tyrone forward O'Neill. In the eighth minute O'Neill turned to wrong-foot keeper Thomas Mallon and shoot into an empty net. O'Neill pounced to fire in his second on 20 minutes after Sean Cavanagh's effort had been blocked by Mallon. Tyrone then rattled off a string of points and reeling Derry were hit again when Peter Harte exchanged passes with Cavanagh to score from close-range. The Red Hands had impressive performers all over the pitch with Colm Cavanagh and Mattie Donnelly both excelling and the only downside for them was a first-half hip injury sustained by the lively Mark Bradley. Tyrone manager Mickey Harte: "Goals are very important in Championship football and we got them in the first half. Getting the third just before half-time probably won the game for us. "Maybe we were not ruthless enough in the second half but it is difficult for players to have the same enthusiasm when you are so far ahead. "We will keep our feet on the ground - we are only in the semi-final." Derry manager Damian Barton: "In terms of the whole package I have to accept responsibility. Emotionally were we right, physically were we right? "We are better than an 11-point deficit. We started the year in a blaze of glory when you look at the McKenna and early league performances. "We were pacy and creative, but that has left us. I thought our leaders on the pitch did not stand up." Tyrone's next match will be the first semi-final on Sunday, 19 June. Their opponents will be the winners of next week's game between Cavan and Armagh. Damian Barton must regroup his Derry team for the All-Ireland qualifiers. Derry: T Mallon; O Duffy, B Rogers, K McKaigue; K Johnston, C McKaigue, G McKinless; N Holly, D Heavron; S Heavron, J Kielt, C McFaul; N Toner, E McGuckin, M Lynch. Tyrone: M O'Neill, A McCrory, R McNamee, C McCarron, T McCann, N Sludden, P Harte, C Cavanagh, M Donnelly, C McShane, M Bradley, R Donnelly, C McAliskey, S Cavanagh, R O'Neill.